Predicting the risk of disease involves screening currently healthy individuals by genome analysis at the individual level. Intervention with lifestyle changes and drugs can be recommended before disease onset. However, this approach is most applicable when the problem resides within a single gene defect. Such defects only account for approximately 5 percent of diseases in developed countries. Most of the common diseases, such as heart disease, are multi-factored or polygenic, which is a phenotypic characteristic that involves two or more genes, and also involve environmental factors such as diet. In April 2010, scientists at Stanford University published the genome analysis of a healthy individual (Stephen Quake, a scientist at Stanford University, who had his genome sequenced); the analysis predicted his propensity to acquire various diseases. A risk assessment was performed to analyze Quake’s percentage of risk for 55 different medical conditions. A rare genetic mutation was found, which showed him to be at risk for sudden heart attack. He was also predicted to have a 23 percent risk of developing prostate cancer and a 1.4 percent risk of developing Alzheimer’s. The scientists used databases and several publications to analyze the genomic data. Even though genomic sequencing is becoming more affordable and analytical tools are becoming more reliable, ethical issues surrounding genomic analysis at a population level remain to be addressed. PCA3 is a gene that is expressed in prostate epithelial cells and overexpressed in cancerous cells. A high concentration of PCA3 in urine is indicative of prostate cancer. The PCA3 test is considered to be a better indicator of cancer than the more well know PSA test, which measures the level of PSA (prostate-specific antigen) in the blood. In 2011, the United States Preventative Services Task Force recommended against using the PSA test to screen healthy men for prostate cancer. Their recommendation is based on evidence that screening does not reduce the risk of death from prostate cancer. Prostate cancer often develops very slowly and does not cause problems, while the cancer treatment can have severe side effects. The PCA3 test is considered to be more accurate, but screening may still result in men who would not have been harmed by the cancer itself suffering side effects from treatment. What do you think? Should all healthy men be screened for prostate cancer using the PCA3 or PSA test? Should people in general be screened to find out if they have a genetic risk for cancer or other diseases? Traditionally, microbiology has been taught with the view that microorganisms are best studied under pure culture conditions, which involves isolating a single type of cell and culturing it in the laboratory. Because microorganisms can go through several generations in a matter of hours, their gene expression profiles adapt to the new laboratory environment very quickly. In addition, the vast majority of bacterial species resist being cultured in isolation. Most microorganisms do not live as isolated entities, but in microbial communities known as biofilms. For all of these reasons, pure culture is not always the best way to study microorganisms. Metagenomics is the study of the collective genomes of multiple species that grow and interact in an environmental niche. Metagenomics can be used to identify new species more rapidly and to analyze the effect of pollutants on the environment ([link]). Metagenomics involves isolating DNA from multiple species within an environmental niche. Knowledge of the genomics of microorganisms is being used to find better ways to harness biofuels from algae and cyanobacteria. The primary sources of fuel today are coal, oil, wood, and other plant products, such as ethanol. Although plants are renewable resources, there is still a need to find more alternative renewable sources of energy to meet our population’s energy demands. The microbial world is one of the largest resources for genes that encode new enzymes and produce new organic compounds, and it remains largely untapped. 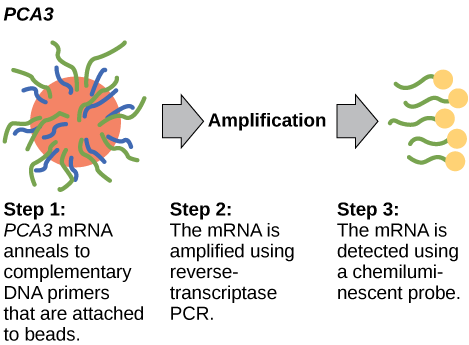 Microorganisms are used to create products, such as enzymes that are used in research, antibiotics, and other anti-microbial mechanisms. Microbial genomics is helping to develop diagnostic tools, improved vaccines, new disease treatments, and advanced environmental cleanup techniques. Mitochondria are intracellular organelles that contain their own DNA. Mitochondrial DNA mutates at a rapid rate and is often used to study evolutionary relationships. Another feature that makes studying the mitochondrial genome interesting is that the mitochondrial DNA in most multicellular organisms is passed on from the mother during the process of fertilization. For this reason, mitochondrial genomics is often used to trace genealogy. Information and clues obtained from DNA samples found at crime scenes have been used as evidence in court cases, and genetic markers have been used in forensic analysis. Genomic analysis has also become useful in this field. In 2001, the first use of genomics in forensics was published. It was a collaborative attempt between academic research institutions and the FBI to solve the mysterious cases of anthrax communicated via the US Postal Service. Using microbial genomics, researchers determined that a specific strain of anthrax was used in all the mailings. Genomics can reduce the trials and failures involved in scientific research to a certain extent, which could improve the quality and quantity of crop yields in agriculture. Linking traits to genes or gene signatures helps to improve crop breeding to generate hybrids with the most desirable qualities. Scientists use genomic data to identify desirable traits, and then transfer those traits to a different organism. Scientists are discovering how genomics can improve the quality and quantity of agricultural production. For example, scientists could use desirable traits to create a useful product or enhance an existing product, such as making a drought-sensitive crop more tolerant of the dry season. Imagination is the only barrier to the applicability of genomics. Genomics is being applied to most fields of biology; it is being used for personalized medicine, prediction of disease risks at an individual level, the study of drug interactions before the conduct of clinical trials, and the study of microorganisms in the environment as opposed to the laboratory. It is also being applied to developments such as the generation of new biofuels, genealogical assessment using mitochondria, advances in forensic science, and improvements in agriculture. [link] In 2011, the United States Preventative Services Task Force recommended against using the PSA test to screen healthy men for prostate cancer. Their recommendation is based on evidence that screening does not reduce the risk of death from prostate cancer. Prostate cancer often develops very slowly and does not cause problems, while the cancer treatment can have severe side effects. The PCA3 test is considered to be more accurate, but screening may still result in men who would not have been harmed by the cancer itself suffering side effects from treatment. What do you think? Should all healthy men be screened for prostate cancer using the PCA3 or PSA test? Should people in general be screened to find out if they have a genetic risk for cancer or other diseases? [link] There are no right or wrong answers to these questions. While it is true that prostate cancer treatment itself can be harmful, many men would rather be aware that they have cancer so they can monitor the disease and begin treatment if it progresses. And while genetic screening may be useful, it is expensive and may cause needless worry. People with certain risk factors may never develop the disease, and preventative treatments may do more harm than good. Explain why metagenomics is probably the most revolutionary application of genomics. Metagenomics is revolutionary because it replaced the practice of using pure cultures. Pure cultures were used to study individual species in the laboratory, but did not accurately represent what happens in the environment. Metagenomics studies the genomes of bacterial populations in their environmental niche. How can genomics be used to predict disease risk and treatment options? 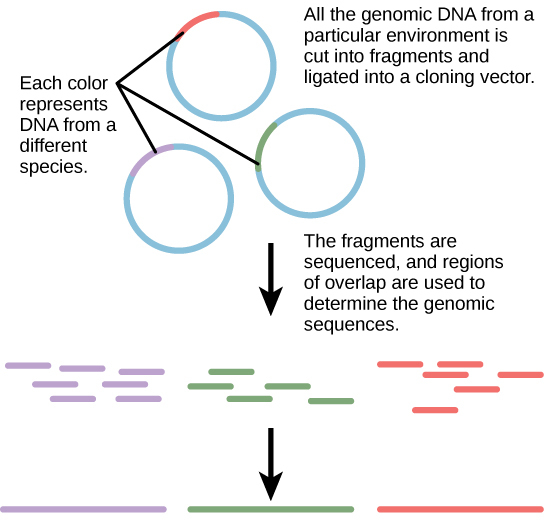 Genomics can provide the unique DNA sequence of an individual, which can be used for personalized medicine and treatment options. Applying Genomics by OpenStaxCollege is licensed under a Creative Commons Attribution 4.0 International License, except where otherwise noted.